I thought this theme was perfect for a book I recently discovered. I am so happy to share Stella Fairy of the Forest with you. Although it is not about recycling or protecting the environment, reading this beautiful story reminds us of all the simple, beautiful things nature has to offer. 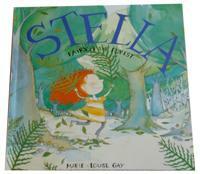 If you've had the chance to read other Stella books, you know just how whimsical and adorable she is. The many explanations she shares with her younger brother are just the cutest! Encourage your group to answer little Sam's questions and compare their thoughts with Stella's explanations. Will they agree that yellow butterflies eat butter? While you are busy appreciating the sheep which look like clouds which have fallen from the sky and the flowers planted by the birds and the bees (...), children will also learn that trees have bark, not skin, that rabbits can't climb, and that porcupines are prickly. Like the main characters, your group will probably look forward to building their own "forest house"...it's the perfect way to celebrate Earth Day!